A 10-year-old boy identified as Daniel Edet Inyang, is currently battling for his life after a wicked man said to be the landlord of the rented apartment he stays with his guardian in Atan Ete Mbakara village in Odukpani Local Government Area of Cross River State, Nigeria, bathed him with hot water following accusation of a phone theft. 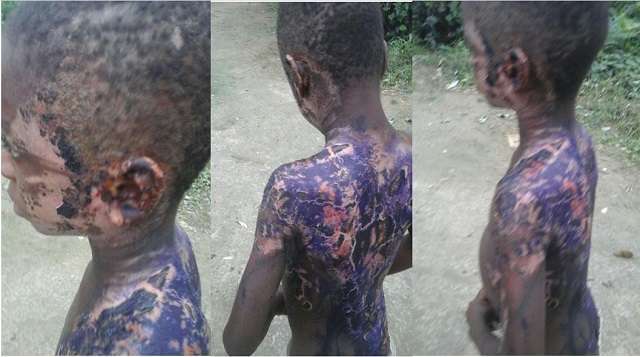 CrossRiverWatch reports that the landlord identified as Anietie, a tailor, had accused the young victim of stealing his phone and in the process of making him to confess, poured the scalding water on the boy making him to suffer first degree burns all over his body. It was also learnt that when the boy's guardian, Obong Ette, reported the matter to the Odukpani Division of the State Police Command, but the officers did not take any action for fear of what Anietie, said to be a very menacing man, would do to them. Photographs of the boy taken by CrossRiverWatch shows parts of his face, from the tip of his left ear through the left part of his forehead, left cheek bone down to the neck, his left shoulder down till almost his elbows and his back, had been peeled off by the hot water.